We understand how buildings and systems work and how to operate them efficiently. We believe that knowing the precise condition of a facility and its assets, what it will cost to maintain, and when major changes will occur, helps clients avoid unexpected expenses and allows them to stay organized and on top of their facility’s needs. Taking a pro-active approach—having programs designed and in place before problems arise—is not only a wise financial investment but also allows the facility to stop wasting precious time putting out facilities-related fires. In response to dwindling financial resources for major capital construction, many companies are looking at ways to better maintain and protect existing capital assets. This requires a thorough understanding of the life cycle costs of a facility including identifying current and future maintenance, operational and capital improvement needs. 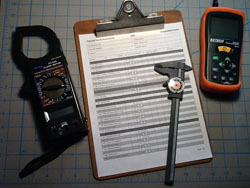 Condition surveys, facilities audits, energy audits, strategic plans, and master plans are all management tools for becoming better prepared for short- and long-term facilities' needs. Our evaluations of operation and maintenance programs have saved facilities thousands of dollars by efficiently utilizing staff, equipment and materials.